A salary is a periodic payment given from an employer according to contract either on a weekly or monthly basis. It is in contrast with an hourly wage which has a different mode of payment. Hourly wages may be paid after few collected hours or exactly after an hour has finished. It has no scheduled to be paid on a periodic basis. Salary is a fixed amount of money paid to the employee for his/her assigned work after a fixed interval of time. Usually, salaries are determined according to the market rate for the same business or nature of the job in the same region. Salaries may also be determined according to an individual employer. A salary certificate is usually required by the individual or any employee from his/her company that prove his/her salary to exact numbers. The employee may need this document as a salary proof at different places. He/she might need it to present at banks, social security office or insurance purpose. 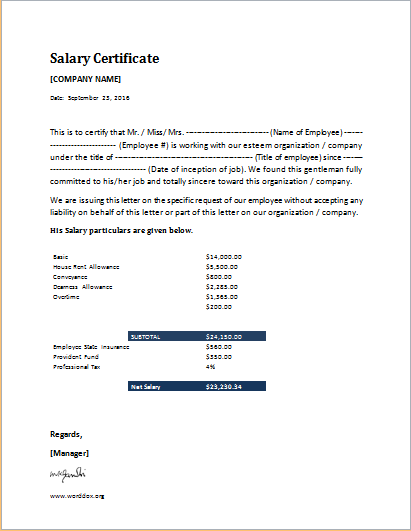 Here we have salary certificate available for you to download and use. A merit certificate is usually issued by an educational institute for the student who performs exceptionally well at the end of year result. The principal or the head of the institute award this certificate to the concerned student. Usually, a ceremony is conducted in the institute premises or somewhere else outside. The certificate can also be awarded for better performance in extracurricular activities category. The merit certificate template can be made to award those individuals who got training in a field. The training could be in sports, a professional skill or social working acts. The local government authorities can make use of this certificate to award those individuals who emerged as the best trainee among different others. 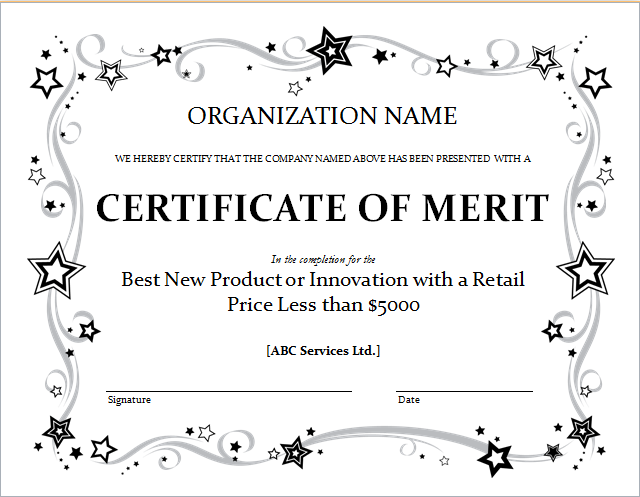 In any department or organization, the head of department or CEO may award this merit certificate to the most efficient employee. The most regular, punctual and hard working employee can be awarded this certificate. Some organization conducts such event at routine. This creates passion and encouragement in the employees to work even better. The merit certificate is best designed to award all those students which are performing excellently in their relevant fields on merit. A best-designed certificate improves goodwill of the organization.